For this month's "Maps Of The Month" featurette, I wish to draw your attention to qwert_vs_qwerty's Teenage Mutant Ninja Turtles III: Radical Rescue (Game Boy) maps. "Yikes!! We gotta go save April." That's what the Teenage Mutant Ninja Turtles say, yet again, as Shredder has made a prison break. But this time, April O'Neil isn't the only one in trouble, as the three Ninja Turtles that stormed Shredder's fortress get captured as well! It's up to Michaelangelo, who was not part of the initial rescue attempt because he was at the pizza joint, to save the other turtles and Master Splinter, and together they can stop Shredder and save April yet again! This Teenage Mutant Ninja Turtles game features a large fortress for the Ninja Turtles to explore. They'll have to use their unique abilities to get around, and look for key cards to unlock doors and get deeper into the labyrinth to face Shredder. By defeating mutant bosses they can obtain keys to unlock cell doors to free another Ninja Turtle to use, or their friends Splinter and April. It's not linear like some other games featuring these heores in a half-shell, but while not as deep as a Metroid game, you will be happy that qwert_vs_qwerty has already taken on Shredder's fortress and mapped it all out to help you save the day (and April) yet again! 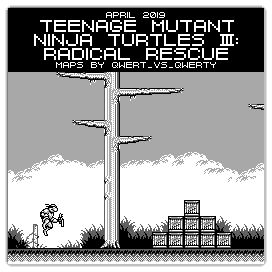 So to recognize this underrated but actually radical rescue, qwert_vs_qwerty's Teenage Mutant Ninja Turtles III: Radical Rescue (Game Boy) maps will be known as VGMaps.com's Maps Of The Month for April 2019.